This week I am guided to use the Ascended Masters Oracle Cards Deck by Doreen Virtue. It is a powerful week of being supported by the ascended masters in taking focused actions even in the last month of summer. It is a week of owning your power and taking focused actions, sharing your true authentic self to the world and opening your heart to forgiveness and love. A beautiful message, enjoy! 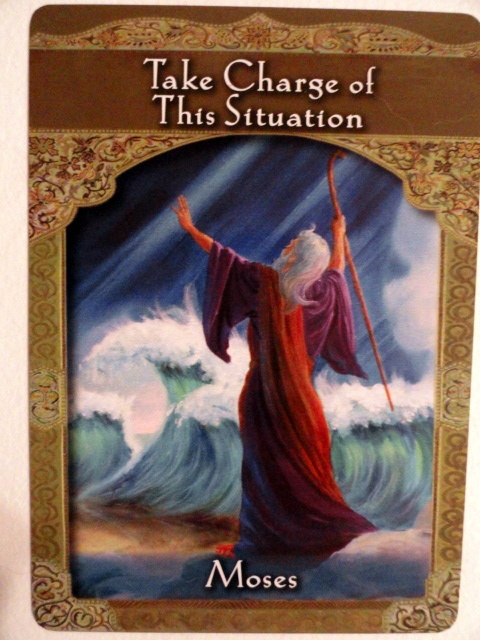 For Monday and Tuesday we have the card ‘Take Charge of this Situation’ with Moses. During his life the prophet Moses showed great courage and leadership The power of his word and focused intentions created famous miraculous events such as the parting of the Red Sea and manifesting manna from Heaven. A motivating leader, Moses can extend support and courage in your life to a situation in your life that you are dealing with and also in your life’s purpose. Moses is guiding us to own our innate power that we have in this situation to heal and direct the course it will take. It is a message of leadership and responsibility. Get very clear first on what you desire including the conditions that are acceptable or unacceptable to you. The universe responds when you are very clear about your desires and intentions. The ascended masters will support your leadership role. You can be totally honest and open with them about all your concerns and feelings. What’s important is to choose an action instead of procrastinating or being passive. Grant yourself the permission to go for it. This card and message is about owning your power and authority. 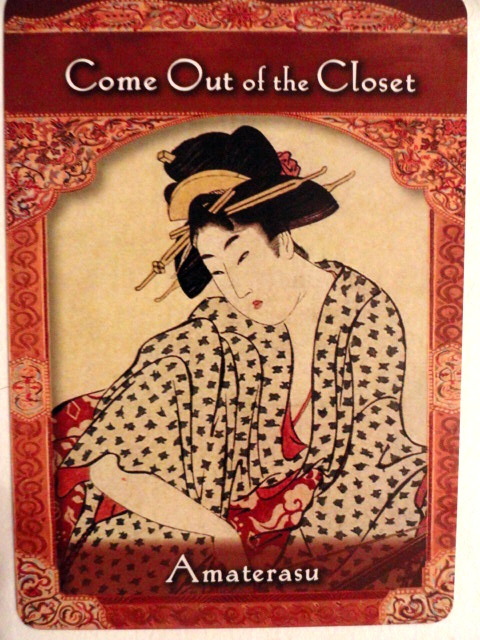 For Wednesday and Thursday the card is ‘Come Out of the Closet’ with Amaterasu, the Shinto sun goddess. It is said that her parents sent her up to Heaven because her light was so bright and radiant and now she shines brightly down on the Earth. She had hid herself in a cave after her brother another God deeply upset her when he had started destroying the world. Upset and unhappy she stayed in the cave while the planet was without sunlight. The other gods did everything to have her come out but nothing worked until they finally placed a mirror at the entrance of the cave. It was then that Amaterasu experienced her own radiant beautiful self that she left the cave. We can ask Amaterasu to amplify our confidence and self esteem and to assist us in being honest and real about who we are to others. With this message it is time to look in the mirror and see our radiant self. Also, to own our feelings and beliefs and confidently share them to the world. This card asks you to let go and open up about who you really are. It may involve having some honest conversations with loved ones and friends. Not to worry you will be guided and supported in this effort. The ascended masters can assist us to be open and lovingly honest. When we let go of judgement of ourself and others, our relationships deepen. The more authentic you are, the higher the energy and success of all your projects. Often this message about coming out of the closet is referred to sexuality but here it can be anything you have hidden and placed in the closet because of fear of being criticized, hurt, judged, disapproved, ridiculed or unloved. It is a great message that Amaterasu will support us in being unleashed this week! 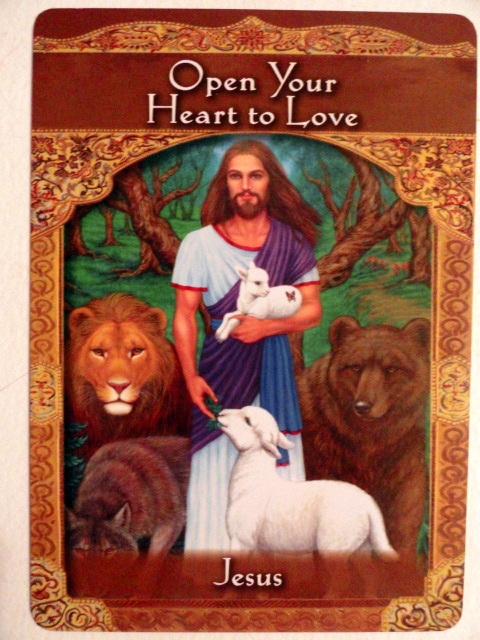 Then for the Friday and the weekend of Saturday and Sunday the message is ‘Open Your Heart to Love’ with the ascended master, Jesus. Opening our heart allows our desires and prayers to be heard and answered. It is the path for receiving and giving of everything in our life. The answer to every question we have including love, relationships, health, life purpose, and more is in opening our heart. The meaning of our lives is in direct proportion to the love we experience in our hearts. Jesus and the other ascended masters can assist us in making sure that you are protected and safe as you do this. To create results in the area of a soulmate or even career let go and heal any fears about giving or receiving love. It is important to forgive those who seem to have hurt us or treated us unfairly. It is a week of truly being loving with yourself. You can also do energy work to open your heart chakra including yoga (camel pose) and meditation. (Oprah’ and Deepak 21- Day Meditation Challenge) In his lifetime Jesus did many miracles and taught about forgiveness and love. It doesn’t matter what your religion is or spiritual beliefs you can call upon Jesus to assist you in healing yourself or others emotionally, physically, or mentally. For your listening you can access my weekly one hour BlogTalk Radio show Saturday at 4pm EST, Let’s Ask the Angels that included this reading, a healing guided meditation and listener calls. Bcalvano-coaching@usa.net For inquiries for your personal angel card reading.